F.B. 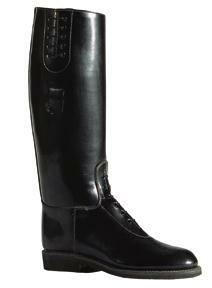 FINE BOOTS #1060FWIL X-Wide Calf police boots will fit the wider calf with ease. The plain top gives a clean elegant appearance. The calf and top are two inches wider than our regular boots. Shown with lace top and high lace ankle. Standard comes with lace top and laces more in foot part than in leg. GLOSSY, GLOSSY UNIFORM LEATHER A REAL UNIFORM BOOT! All of the options that come on our regular boots are available on F.B. FINE BOOTS X-Wide Calf boots. This includes steel toes, lug soles, reflector-tops etc.